1.Wash moongdal and pour water and soak it for 10mins and boil it in cooker for 4 whistles. 2.Peel the skin of ginger and garlic. grind ginger or if u can eat pieces then chop ginger into small pieces. chop garlic cloves into small pieces.slit green chillies lengthwise into two. 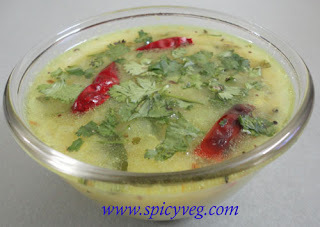 3.Heat a pan add oil, urad dal, cumin seeds, mustard seeds, chopped ginger, chopped garlic, greenchillies, curry leaves. 4.Now add 1/2 tumbler water and then add boiled moongdal. now add remaining 1/2 tumbler water. 5.Add 1tsp salt, turmeric, coriander leaves. boil it for 10-15 mins. 6.Switch off the stove and after 5mins add 1/2 piece of squeezed lemon juice. ( dont add lemon juice while it is on stove it gives bitter taste). 7.Tasty pesarakattu is ready to serve with rice.